FILE - Li Rui, a former secretary to Chairman Mao Zedong, listens to a question during an interview in Beijing in 2006. Li Rui, who was Mao Zedong's secretary in the late 1950s, celebrated his 101st birthday in a hospital ward recently, feted by "almost all of my friends in and outside Beijing" who sent greetings or visited. "People coming and going, it was extremely busy," he said, adding, "I will live longer. I feel my health is no big problem." Last month, between visitors to his room in Beijing Hospital, an institution that tends to senior cadre, Li spoke with VOA's Mandarin service. He criticized Mao, something that has landed him in prison in the past, and decried the "low education" of China's current leader, Xi Jinping. One of Mao's few remaining early compatriots, Li Rui is "a deeply respected … former secretary of Mao who suffered during the Cultural Revolution and helped establish the institutions of post-Mao collective leadership," according to David Ignatius, writing in The Washington Post after China's 19th Communist Party Congress in October. Li signed up with the party as a young man. He joined Mao's forces in their stronghold, Yanan, where he wrote editorials for the party newspaper, Liberation. His outspoken work earned him a year in prison on charges of spying after a purge of so-called reactionaries. But upon his release, Li continued to rise within the party. FILE - Chairman Mao Zedong at general assembly of the Chinese communist party in March 1955. Mao selected Li to be one of his personal secretaries in 1958 on a part-time basis. He fell from favor when he criticized an economic policy — the Great Leap Forward — designed to create industrialized, self-sufficient communes, and by inference, Mao. Li was stripped of his party membership and positions following the 1959 Lushan Conference, a gathering that resulted in a "second leap" that led to the party's criticism of Mao. Li was jailed for eight years in Qincheng Prison near Beijing, his incarceration overlapping with the beginning of the Cultural Revolution in 1966. After the turmoil ended in 1976, he was rehabilitated and appointed deputy minister of the Central Organization of the CPC. Most recently, he declined an invitation as a senior party member to the opening of the 19th party congress. Why Li did this is a matter of debate. It may have been a way to register disagreement with Xi's consolidation of power or because of an article credited to him that came out against censorship by the government and urging it to allow people to speak freely, which are lasting concerns of Li's. As he entered his 102nd year and spoke with VOA, Li laughed at what he called "a thing on the internet" credited to him: "Mao's mistakes are not corrected and Xi accumulates his evil." Li praised Xi Zhongxun, the father of China's current president, while expressing disappointment with the son. "When did I last meet with Xi Jinping? When he was secretary of the Zhejiang Provincial Committee of the Communist Party of China. … His level of education was so low," Li said. 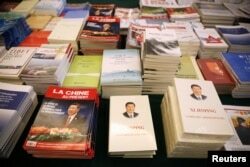 FILE - Magazines and books, featuring Chinese President Xi Jinping on the cover, are seen at the media centre during the China's National People's Congress (NPC) in Beijing, March 7, 2018. Xi graduated from Tsinghua University, where he completed a graduate program in Marxist theory and ideological and political education, and has a doctor of law degree, according to official state media. Those educational accomplishments are widely derided by China's netizens, and to VOA, Li described Xi as operating at an "elementary school level. … Of course I did not look down on him … because he was a son of Zhongxun, who was remarkable." Xi Zhongxun "commanded Communist guerrillas in northwest China, rose to the rank of deputy prime minister after the 1949 revolution, got ousted by Mao Zedong in 1962 and, after 16 years in disgrace, re-emerged to pioneer some of China's boldest economic reforms," according to the Post. Li also took aim at the proliferation of television dramas about Mao, who is shown variously on the Long March, fighting the Japanese and being a hero of the revolution. "There are four or five television dramas being aired these days about Mao Zedong," Li told VOA. "There are too many dramas about Mao Zedong." 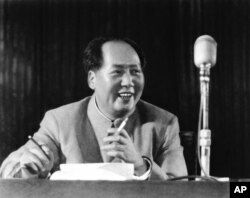 Mao "hated intellectuals," Li told VOA. In Yanan, the Rectification Movement, an effort to thwart challenges to Mao's position, was a way to criticize Wang Ming, a rival, and Zhou Enlai, who was born to the gentry and educated in France. "In fact, first, those who had been international students; second, university professors; third, major officials — all were [intellectual] counterrevolutionaries" to Mao, Li said to VOA. Secondary school teachers and middle officials "were semi-revolutionaries," he said. "[Then] primary school teachers. "Mao from his bones disliked intellectuals. … After all, Mao was still a peasant and he was extremely narrow-minded." Li's latest criticism of Mao is not something new or quiet. "As early as 1958, Mao said the personality cult was necessary," Li told The Guardian in 2005. "By the time of the Cultural Revolution, this had become an evil cult." "Mao's methods were even harsher than the emperors of ancient times," Li said. "He tried to control the minds of the people." Li acknowledged, however, that "in the past, if I talked like this, I would have been killed or jailed."